The divisional round of the NFL playoffs took place this past weekend and now four teams remain standing; the New England Patriots, Kansas City Chiefs, Los Angeles Rams, and New Orleans Saints. These four teams will play in the conference championship games next Sunday in hopes to make it to the Super Bowl. The first game of the weekend featured the offensive juggernaut Kansas City Chiefs (1st seed) hosting the red-hot Indianapolis Colts (6th seed). Many believed the Colts would upset the Chiefs and carry their five-game winning streak to the AFC championship game, but they came up short falling to the Chiefs 31-13. 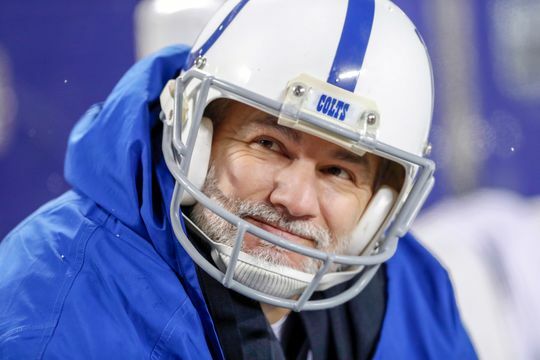 Andrew Luck had a mediocre game going 19/36 through the air for 203 yards and 1 touchdown. The Chiefs defense came up big Saturday evening sacking Luck three times, getting past the best offensive line in the league. Luck and the Colts also failed to convert on third down for the entire game going 0/9. The Colts veteran kicker, Adam Vinatieri, missed a PAT and a field goal which did not help the Colts in this one. Patrick Mahomes shined in his first career post season start going 27/41 for 278 yards and scoring a touchdown run. Although his stats don’t seem too much better than Lucks, he did a phenomenal job extending plays and leading his team down the field. Travis Kelce and Tyreek Hill helped Mahomes make plays through the air while Damien Williams stepped up in the absence of Kareem Hunt, running for 129 yards and catching 5 passes for 25 yards. Kelce caught 7 out of his 10 targets for 108 yards, proving he is one of the best, if not the best tight end in the NFL. The Chiefs will host the Patriots at Arrowhead Stadium Sunday night for the AFC Championship game, their first AFC Championship game since Joe Montana led them there in 1993. The Saturday night game featured the Los Angeles Rams and the Dallas Cowboys. The game was played at the Coliseum in Los Angeles, and the Rams (2nd seed) defeated a very strong Cowboys (4th seed) team. The Cowboys finished the regular season winning nine of their last ten games beating out the Eagles for the NFC East division title. The Cowboys gave it their all but could not keep up with the very talented Rams who won 30-22. Dak Prescott had a solid game throwing 20/32, for 266 yards and a touchdown as well as scoring a rushing touchdown. He made plays when he could, but he was playing catch up for the majority of the game. The Cowboys run game suffered against the Rams who held running back Ezekiel Elliot to 47 yards and one touchdown. This was the key to the Rams impressive victory considering Elliot is used to averaging 80-100 yards per game. 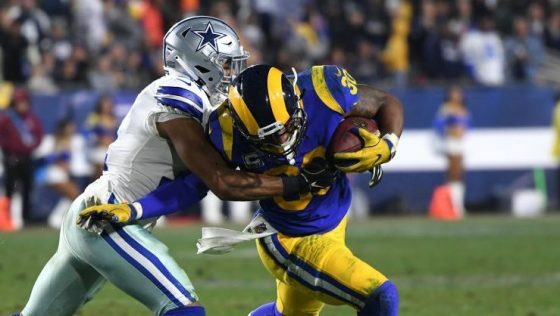 The Rams also did a great job shutting down Amari Cooper, the Cowboys number one receiver, holding him to a measly 6 receptions for 65 yards and a touchdown. On the other side, Jared Goff had an error free game throwing 15/28, for 186 yards. He did an exceptional job working with his running backs Todd Gurley and C.J Anderson. Gurley rushed 16 times for 115 yards and one touchdown while teammate Anderson rushed 23 times for 123 yards and two touchdowns. The Rams dominant run game and blocking kept their defense fresh and helped them control this game. Goff was not sacked during the game and was 5/11 on third down conversions in comparison to the Cowboys 1/10 on third down. The Rams will head to the Mercedes-Benz superdome in New Orleans Sunday evening to face the Saints in the NFC Championship game. The Sunday afternoon game took place in Foxborough, Massachusetts at Gillette Stadium home of the New England Patriots (2nd seed). The Los Angeles Chargers (5th seed) came into Foxborough hoping to beat Tom Brady and the Patriots for the first time in history (0-8). The Chargers came up very short falling to the Patriots 41-28. Despite what many critics believed, the Patriots came to play and put up 35 points in the first half of the game. 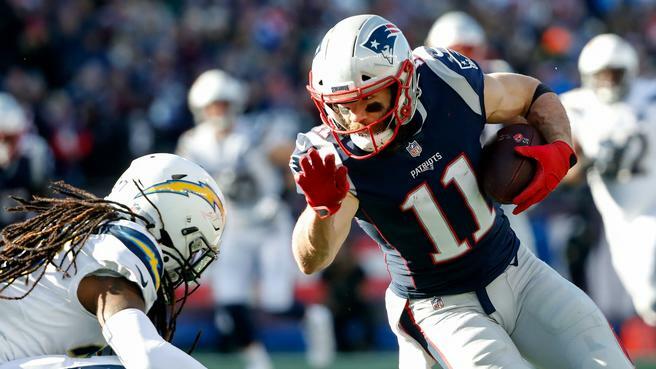 The Patriots scored a touchdown on each of their first four offensive drives, and eventually scored a fifth touchdown on their sixth drive after a muffed punt by Chargers punt returner and corner back Desmond King. Brady had a strong game throwing 34/44 for 343 yards and a touchdown. He hooked up with receiver Julian Edelman nine times for a whopping 151 yards and found receiver Phillip Dorsett in the endzone for a 15-yard touchdown pass. Brady was well protected for the game taking no sacks and helping the team convert 7/14 third downs as well as a fourth down. The Patriots running back Sony Michel finished the day with 24 carries for 129 yards and three touchdowns. James White, the other Patriots running back, caught 15 passes for 97 yards. The Patriots played a very solid game in all phases silencing some of the critics. The Chargers struggled in the first half. 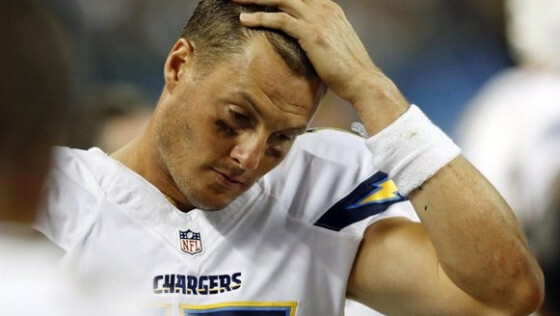 Philip Rivers went 25-51 for 331 yards, three touchdowns, and one interception. Rivers was pressured for much of the game and could not dig the Chargers out of the deep hole they were in after the first half (down 35-7). The Chargers outscored the Patriots 21-6 in the second half with help from receivers Tyrell Williams and Keenan Allen as well as veteran tight end Antonio Gates. Williams caught 5 passes for 94 yards and Allen caught 2 passes for 75 yards and a long 43-yard touchdown. Gates caught 5 passes for 41 yards and a late fourth quarter touchdown that did not have much significance. The big problem for the Chargers was their inefficient run game. Chargers running back Melvin Gordon struggled with 9 carries for only 15 yards and one touchdown. This game came down to time of possession, which the Patriots dominated, having the ball on offense for 38 minutes compared to the chargers 21 minutes. The Patriots will head to Arrowhead Stadium Sunday night to face the very talented Kansas City Chiefs in the AFC Championship game. This will be the eighth consecutive AFC Championship game for Tom Brady and the Patriots. The Sunday night game was between the New Orleans Saints (1st seed) and the Philadelphia Eagles (6th seed). The Eagles were on a four-game winning streak, upsetting the Chicago Bears last weekend in the wild card round. 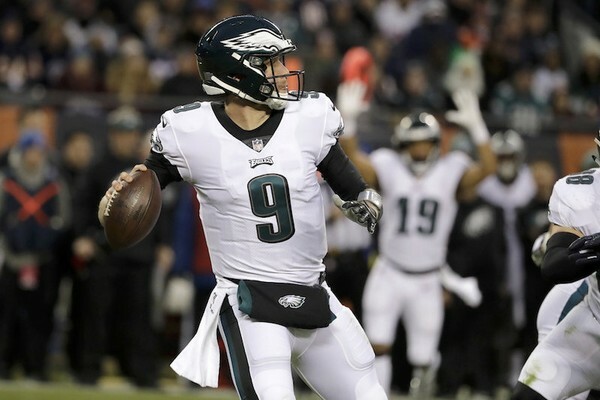 The Eagles turned their season around after putting last year’s Super Bowl MVP, Nick Foles, in for injured starting quarterback Carson Wentz. Foles had won 10 of his last 12 starts before the Eagles disappointing 20-14 loss against the Saints. Foles went 18/31 for 201 yards, a touchdown, a rushing touchdown and two interceptions. The Eagles started the game off red hot with Cre’von LeBlanc picking off Drew Brees on the first play from scrimmage. The Eagles capitalized on the interception with a strike from Foles to Jordan Matthews for a 37-yard touchdown. The Eagles scored 14 points in the first quarter but failed to score after that. Wendell Smallwood had a quiet game with 10 carries for 33 yards. Alshon Jeffery had a solid game with 5 receptions for 63 yards but made a crucial drop with 2 minutes left in the fourth quarter, shattering the Eagles’ hopes to advance to the NFC Championship game. The Eagles had trouble converting on third down going 2/7 for the night against the Saints defense. Despite the awful start from possible MVP Drew Brees and the Saints, he bounced back throwing 28/38 for 301 yards, two touchdowns and one interception. 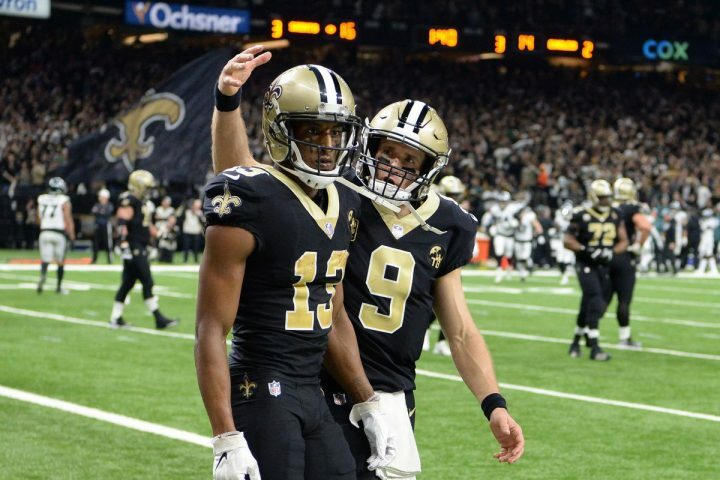 Saints receiver, Michael Thomas, had a huge game getting open and catching 12 passes for an astounding 171 yards and a touchdown. The Saints also had a great game on the ground with Alvin Kamara rushing 16 times for 71 yards and Mark Ingram rushing nine times for 53 yards. The Saints turned things around in this one scoring 20 unanswered points and converting 8/15 on third down and 2/2 on fourth down. The Saints will host the Rams in the superdome Sunday evening for the NFC Championship game. Both teams have won a Super Bowl and hope to get their chance at second championship.